If you're slow, you'll never catch the Market! I'd had Portobello Market sitting on my shelf for a while now, without managing to dig it out and play it. At least part of this was my impression that it was a fairly lightweight family game. This was an impression that didn't survive past the first few moves, as I was continually cut off from my own best scoring opportunities, or forced to hand my opponents points, simply to take the moves I wanted. I consider the game an abstract, since despite the market-stall theme (which replaces an earlier train route theme), the game is entirely one of controlling the best spaces in links and the scoring multipliers on each. Certainly, the dark blue police-eeple is reminiscent of the British Bobby's helmet, but otherwise the theme does nothing to anchor the game. Components-wise, about the only grumble is that the player pieces are supplied in different numbers for each colour. This forces 2-player games to always use red and yellow pieces, and not the green or blue. It's an annoying economy. The pieces are chunky shaped wooden rectangles that represent roofed market stalls and are placed in the marked stall positions along each of the lane-ways. 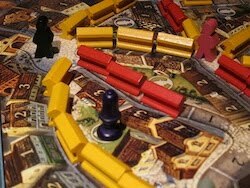 The board itself is illustrated with Londonesque buildings, evoking a sense of business in pre-car London, complete with cobblestoned squares and riding and draught horses as details. The illustrations don't get in the way of the critical part of the game, which is identifying the values (between 1 and 3) of available market stall spaces. A nice touch is the numbers of stalls are repeated on the houses next to them, so already placed stalls can be valued at a glance. The game makes use of both the lanes, the squares at their ends, and the regions that they surround. During the game, the players will take turns, each consisting of between 1 and 4 actions. Each player is issued with a 2, 3, and 4 action tokens which can be used to take that many actions each turn. A used token is flipped upside down and only becomes available to use again once all three of the player's tokens have been used. Players can choose to use their actions either placing stalls or placing customers. Stalls are placed in lanes surrounding the policemen. Lanes are always fillled from one end, so there can be competition over the high-valued spots which are sometimes in the middle, and sometimes on the ends. The policeman figure can be moved freely by the current player, but it is only free over lanes where they have a strict majority of stalls placed. Otherwise they must pay a victory point per lane crossed to either the majority player(s), or the bank if the lane is empty. Customers are drawn randomly from the bag (which has 5 low-value grey and 5 medium-value pink) and are placed in an empty square of the player's choice. Once all 10 customers have already been placed, the high-value black Baron figure is automatically placed in the sole remaining square. Once one of the higher value pink customers or the Baron is placed into a square, all the players tend to build towards it to take advantage. The goal of both actions is to gather points by triggering the scoring of a lane. This occurs when a lane is filled with stalls and has a customer at both ends. All players receive points according to the value of stall spaces they occupy with a multiplier (1x to 4x) derived from the values of the customers at both ends. Players also have the option of skipping their turn to score a region. They can give up a face-up 2 or 4 action token and place it in an unscored region receiving 2 or 4 points for every stall they own in the surrounding lanes. No other players score anything. Players also receive a replacement token from a stack. The players who score regions earliest get 3-action replacement tokens, later ones may get a 2 or 1-action one, so there's some motivation to score regions early, at least in games with lots of players. The game ends is triggered once one player has placed all their stalls. At the end of the game, incomplete lanes (missing stalls or customers) are not scored, unless the special black Baron customer is at one end of the incomplete lane, and the winner is the player furthest along the score track. This end condition also means that spending too many of your actions on customers, or giving up your 4x marker too early in the game can leave you far behind in stalls which are the only way to gain points. I actually enjoy the 2-player game, but as always, the game devolves into a tight struggle where every point for your opponent is a point lost. The two-player game seems to play quite quickly, as play moves back and forth over the roads which are most likely to be finished and score by the end of the game. The idea of which these are can change a bit, and the game feels over far too quickly, with the last few turns a harsh reminder that starting too many plans can leave you critically short of market stalls. Up close, the 2-player game has a few other interesting features. The bobby can be moved around a lot more easily since you'll likely own majorities on almost half the roads, so there are many more free moves available. Of course, correct positioning of your new stalls is almost always worth more than giving a point or two to your opponent; the barrier is more psychological. With 3 or more players, the game can see-saw around a little, depending on which players look to be coming out ahead, and there are usually choices to be made about which player you should help complete a road (or which player you need to stay points-neutral with by sharing a road that's going to be completed anyway). With multiple players moving the bobby for their own ends (and it often being much more expensive to move him since you will own many fewer roads), play tends to spread out over the board much faster. Portobello Market does become more chaotic with more players, but both 2 and 3p games are interesting and reward planning rather than feeling like a forced ride. Most moves to take advantage of things also create opportunities for other players (including placing customers), so it's a game of timing, and leaving just enough opportunity to encourage someone else to help you. It's far from a heavy game, and makes an attractive and short quite-abstract game to fill a short time slot.